inhumans que vendria a ser? es una nueva ip? mmm...esto tiene alguna relacion con los que viven en la luna? y que el "rey" de ellos no puede hablar porque si habla destrulle el universo?? ShonenBushido escribió: mmm...esto tiene alguna relacion con los que viven en la luna? y que el "rey" de ellos no puede hablar porque si habla destrulle el universo?? Oh dios su increible superpoder es que sabe Karate!!!! no me gusta marvel, se nota ¿no? Rumores, rumores... si llega a ser cierto, se van a limitar a AoS. NYCC ’15: Inhumans Movie Cancelled By Marvel As Film Goes To War With TV? At New York Comic Con, it was announced that Marvel Studios would change the schedules of their first black solo lead and female solo lead films, Black Panther and Captain Marvel, to accommodate a new project, Ant Man And The Wasp. This seems like the first public sign of the new Marvel Studios, divorced from the rest of Marvel and reporting directly to Disney as part of a coup by Marvel movie boss Kevin Feige against Marvel CEO Isaac Perlmutter. The status of the planned Inhumans movie remained unchanged however, Publicly at least. 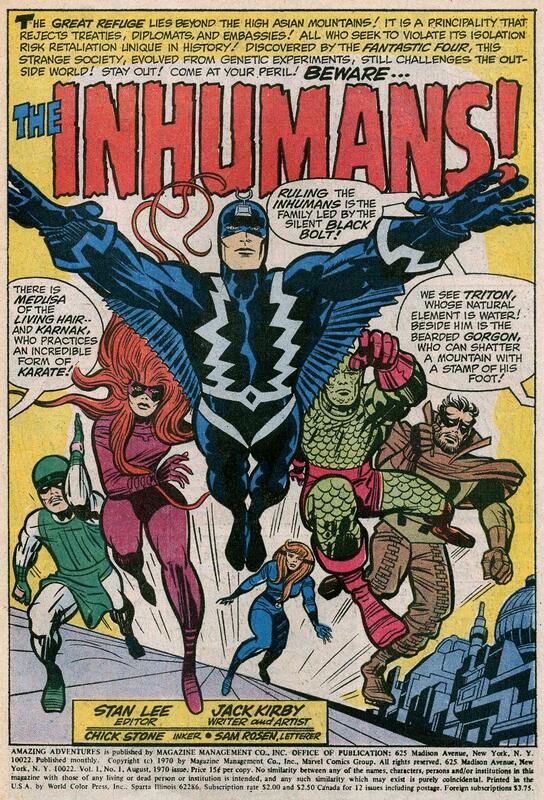 In the New York bars last night I heard from other well connected sources that the second shoe dropping will be the move of the planned Inhumans movie off the slate completely. That was the film most pushed for by the Marvel TV side, which still reports to Perlmutter. And to which Marvel’s Agents Of SHIELD has committed to providing three years worth of promotion towards in its storylines, establishing the Inhumans concept to the fans. Until that point, the TV was mostly an afterthought, having to catch up to the film continuity rather han provide anything for the film’s to use.